The straightforward options for the interior would have been to make the units out of plywood (heavy) or foam sandwich (unattractive). Instead we elected for Tricell, a Gaboon ply sandwich with cardboard honeycomb core. It is lightweight, good for making into curves and attractive. 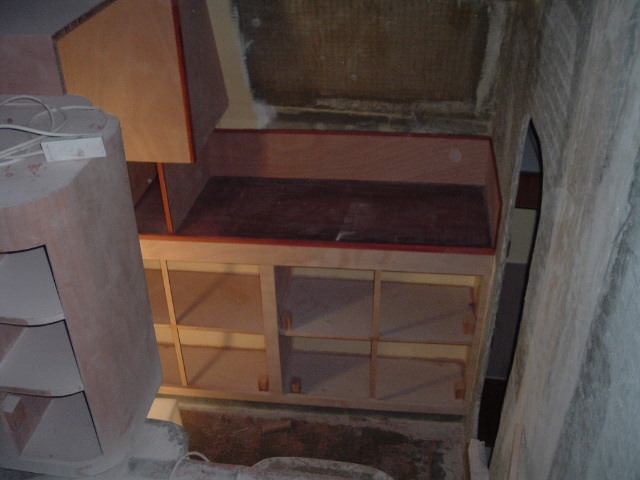 Disadvantages are that it is not cheap and somewhat timeconsuming to work with - perhaps 2-3 times as much labour as using ply. One aspect of working with it that takes a lot of time is finishing all the edges, if a cupboard door is cut out all the edges need to have the honeycomb removed and edge filled with another strip of ply. However the result is well worth the effort. 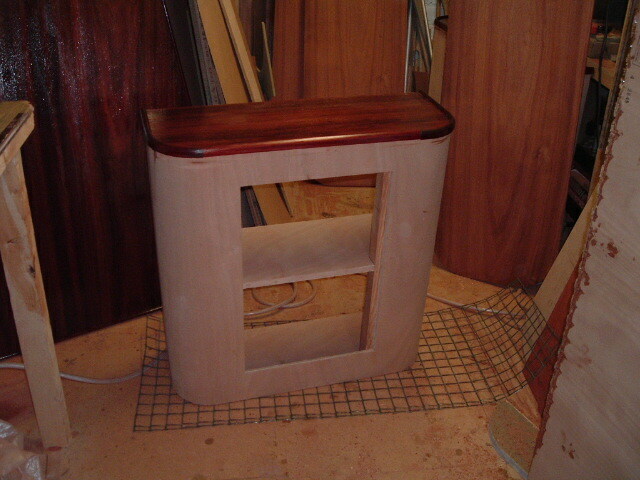 For trim we went for Padauk, it is a reddish hardwood and was able to get it in plank form and veneer. Actually it looked very red in the book and when the samples arrived, after exposure to sunlight it goes much darker and is not far off a reddish mahogany which was not quite what I expected but still looks good. I was able to get a heave of planks at a very reasonable price, comparable to somethin like Oak. 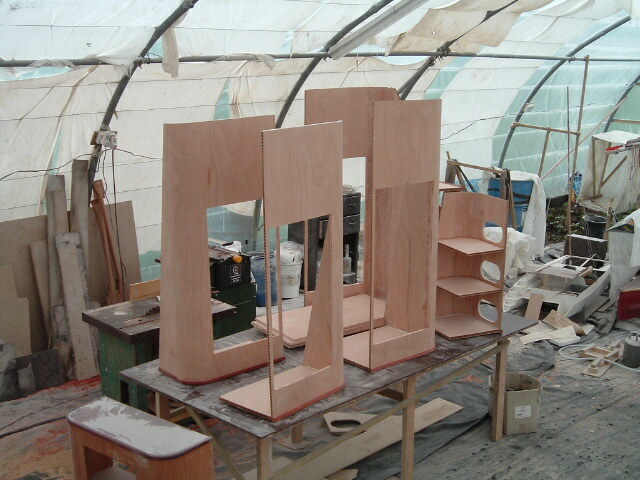 During the winter of 2005/2006 I worked in my garage making some of the Tricell units. 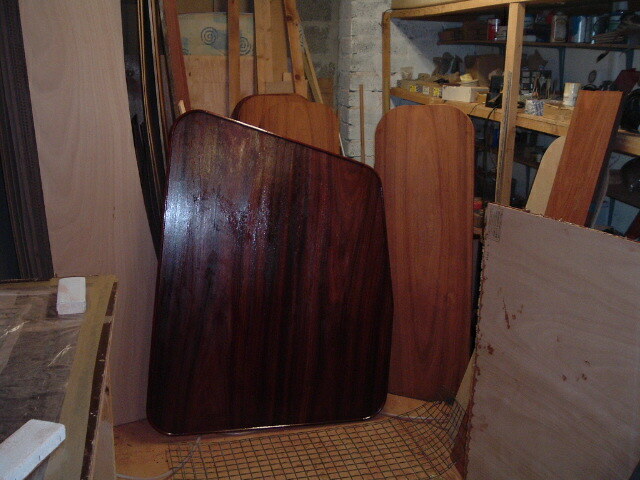 The slaoon table is Tricell with Padauk veneer , as are the interior doors. This was my first attempt at doing any veneer work but using the same vacuum bagging system as on the foam sandwich it worked well. Unit for the saloon. Bending the tricell around curves is quite easy but finishing off is all very time consuming. Units for the bow and main cabins. Seating area in the saloon. 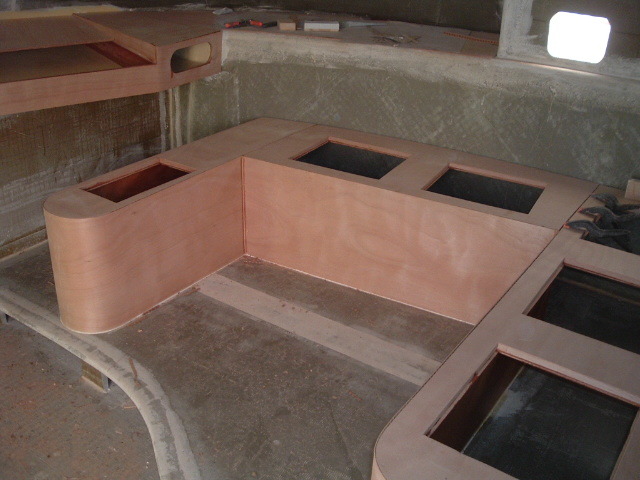 We have a plinth on the port side with ‘U’ shaped seating around the area for the saloon table. Up against the port hull we have our chart table and workstation, with the left arm of the U seating being used for both nav. station and saloon table. Chart table. The steps down into the hull are just to the left of it. 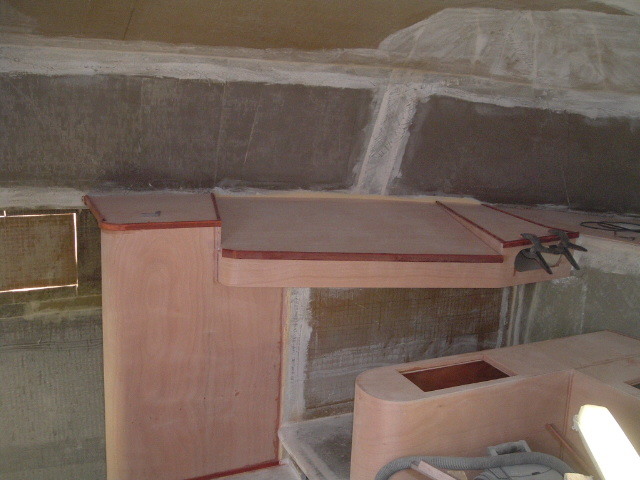 Starboard side of the hull, this is our galley area. 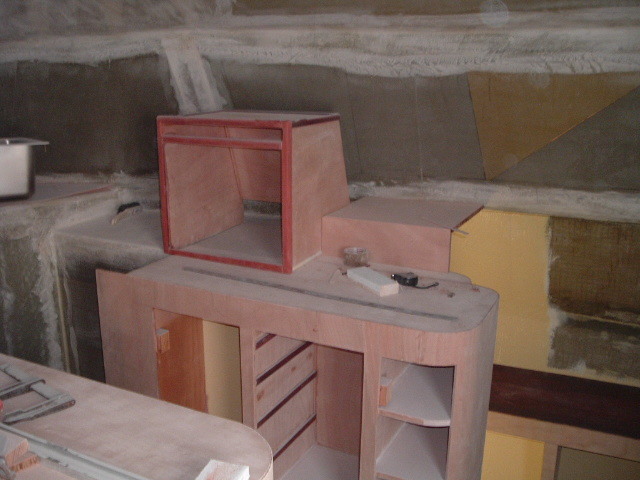 The box unit is for the oven. Our layout in each hull is: Bow cabin, head, corridor, main cabin. This shows the corridor area with good storage units outboard. On the Starboard side we expect to use this as an extension of galley storage. On the port side is is our workshop. Am very pleased with how our layouit has worked out, it seem to have given us more space and storage than some other similar sized boats I have looked at, the only disadvantage being that you have to pass through one of the heads to get to the forward cabin. This is the limit of progress as at the end of 2006.